What accounts for species diiversity, specifically species richness, in an urban park? Is it the size of the park? Is it habitat diversity within the park? Is it the location of the park relative to birds' migration route? I am interested in these questions because of my interest in urban ecology, but also specifically because I am involved in a long-term wildlife survey project in Washington Square Park, a 9.75-acre located in NYC. Looking at the park acreage, you would expect that Central Park at 843 acres would have the most bird species. It does. You probably also know that those 843 acres are packed with different types of bird-friendly habitats. But acreage and habitat abundance can't be the entire story. Bryant Park at 9.6 acres is 1.1% the size of Central Park, yet it has 55% of the number of species of Central Park. Bryant Park is a well-established hotspot for a very broad range of birds. Read the guide to birding in Bryant Park by NYC Audubon. The guide points out several "best birding spots" in the park: perennial borders, the London planetree allees surrounding the park, honey locust stands, and a limited access maintenance area. Other parks have these elements and more so what else could account for such high numbers in Bryant Park? The NYC Audubon guide provides a clue. Bryant Park is located in midtown Manhattan and is densely surrounded by some of the city's tallest buildings. The park appears as an oasis during nighttime migration flights. After a long night’s flight, nighttime migrants flying over Manhattan must seek a place to rest and feed among the City’s landscape of cement and glass. The results can be almost surreal. The other small parks on the chart aren't similarly located. Another major factor which is not directly related to the biogeography of the park is the data generation process, specifically who records the data and when is a bird species recorded on a checklist. Consider the first aspect. The bird numbers presented here were taken from eBird Hotspot Maps. eBird is a contributory citizen science project meaning members of the public are submitting the data. Maybe people who bird in Bryant Park log their data with eBird more than birders in other parks. 2112 Bryant Park checklists have been submitted to eBird versus 428 in Madison Square Park and 289 in Washington Square Park. An element that connects this first issue with the one I explore in the next paragraph is the defining characteristics of the data recorder. 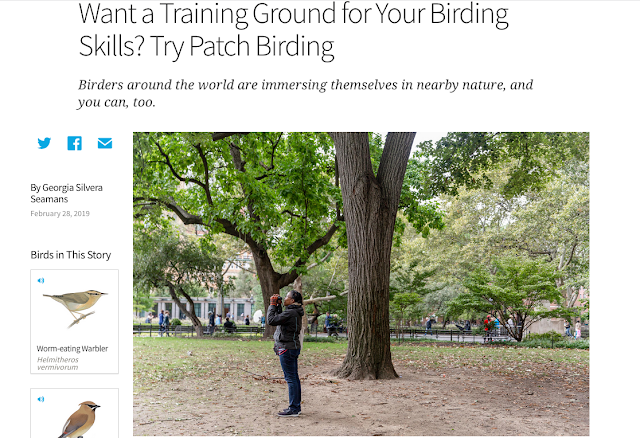 If the person is an expert birder, she might spot more birds than a newer birder. If the checklists for a park are derived primarily from expert-led bird walks then more birds might be recorded in that park. The second component of the data factor is what counts as a species sighting. Who is contributing the majority of species records in each park and what criteria are they using? WSP Eco Projects follows a standardized bird survey protocol but this is not the case for each member of the public birding in a NYC park. For the purposes of the long-term wildlife survey, we only record birds that are seen within the boundaries of the park with the exception of the resident nesting pair of Red-tailed Hawks. Other birders might record flyovers and birds identified by sound only. Species diversity in these NYC parks seems to derive from a combination of factors -- within-park habitat, the urban form of the surrounding matrix, the number of eBirders in the park. 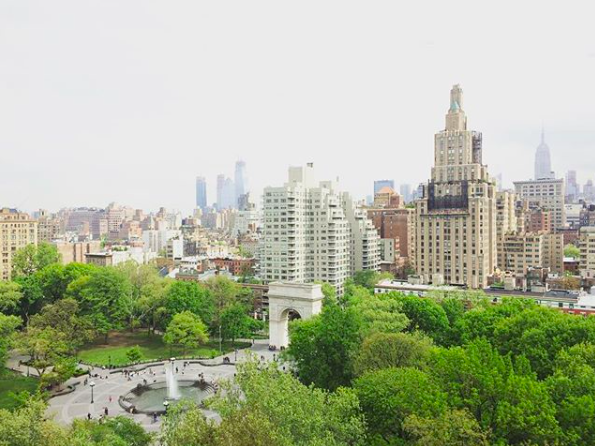 It's worth comparing Bryant and Central Parks again. Bryant Park has 2112 checklists to Central Park's staggering 13,583 checklists. Bryant Park only has 15% the number of checklists as Central Park yet it has 55% the number of total bird species of Central Park. There's something about Bryant Park! I don't envy Bryant Park's location in the city but I do think Washington Square Park can be made more bird-friendly through habitat management. WSP Eco Projects has an advocacy mission, too. In our first two permit reports, we encouraged the NYC Parks Department to consider expanding its herbaceous perennial beds in terms of size and native species. We also recommended planting more fruit-bearing and evergreen woody species. We will continue to make the case for bird-friendly plantings in Washington Square Park. P.S. As I wrote this post, the chart became outdated. Madison Square Park now has 100 bird species. This is SUCH a fascinating post! May your efforts for increasing the park cover with native species be (literally) fruitful--what a win that would be for increasing the bird diversity of WSP. Hi Bryony, thank you! I think about bird species diversity and composition in the park A LOT. Light is a major factor that attracts nocturnally migrating birds to specific locations. Its very likely that intense nighttime lighting of Bryant Park is the major factor in attracting species to the location. It is also birded during migration twice weekly by one of the best birders in New York City. Hello. Thank you for your observations. I had considered the frequency of birding in Bryant Park, but not your second point about the effect of nighttime lighting.